It’s time for the last Master Notes of 2018, barring some sort of cataclysm that requires 1,000 words of half-baked fantasy baseball advice and vaguely amusing wisecracks. The Emmy Awards were the other night, and in that spirit I’d like to accept the award for Best Column With Half-Baked Fantasy Baseball Advice And Vaguely Amusing Wisecracks,” and do my thank yous. Also a few no-thank-yous. Thanks... To all the great young players in the game. In 2018, we have 21 hitters age 25 and under with 350+ ABs and .800+ OPS. And 30 more of the same age with slightly lower OPS marks. Fantasy owners must be already calculating how to choose from among Mookie Betts, Jose Ramirez, Alex Bregman, Ronald Acuna, Juan Soto, Manny Machado, Javier Baez, Trevor Story, Brandon Nimmo, Francisco Lindor, Matt Chapman ... and lest we forget, Bryce Harper, still just 25. On the pitching side, we can look forward to more seasons from the likes of starters like Blake Snell, Aaron Nola, Walker Buehler, Kyle Freeland, Jack Flaherty, Brad Keller, Carlos Rodon, Noah Syndergaard and Luis Severino, all 25 or under with ERAs under 3.50. And you have to be chomping at the bit to bid on relievers like Edwin Diaz, Joshua Hader, Caleb Ferguson, Seranthony Dominguez, Jace Fry and Jose Leclerc, all 25 or under with BPVs over 150, ERAs around 2.00 and WHIPs around 1.00, not to mention Dom rates well into double digits. Thanks... to my top three starters on my Tout team. Gerrit Cole, Masahiro Tanaka and Mike Clevinger combined for more than 500 innings of 3.12/1.10, which has kept me floating near the top of the decimals in my league. But no thanks... to my “relief” corps, which has provided 385 innings of 4.35/1.34 decimals. If they could even have matched my top starters, I could have had 11 points in each of the decimals categories. And no thanks... to the #@^%$! wins category. As I mentioned in a previous Master Notes, my starters are converting PQS-DOM and Quality Starts into wins at a rate under 50%. Gamewide average is well over 50%. I’m 11th in Wins. #@^%$! Thanks... to all the fantasy baseball experts who appeared as featured guests on BaseballHQ Radio this season. In alphabetical order, they were: Jason Collette, Derek Carty, Glenn Colton, Rudy Gamble, Mike Gianella, Brent Hershey, Justin Mason, Gene McCaffrey, Lawr Michaels, Ray Murphy, Scott Pianowski, Dave Potts, Michael Salfino, Joe Sheehan, Paul Sporer and Jeff Zimmerman. And thanks... to all the BaseballHQ.com regulars on the podcast. HQers Alex Beckey, Greg Fishwick, Rob Gordon, Harold Nichols and Jock Thompson kept our listeners in the know all season with their news reports and commentaries. Thanks also to Todd Zola, the regular guest on the weekly “Talk With Todd” segment, and consistently delivered thoughtful, interesting and challenging ideas. Thanks... to Ray and Brent (again) for supporting my work at BaseballHQ. Ray has long stood behind our BaseballHQ Radio podcast, and has shown tremendous patience with the occasional technological mishaps and willingness to pinch-hit when last-minute cancellations occurred. Brent is the editor of the site, and has always encouraged me in my weekly Master Notes column and been a great source of ideas. Thanks... to the Rays for developing the "opener" system for pitching. I get that it was kinda-sorta because they had no choice, but they say "necessity is the mother of invention." Whatever its beginnings, the Rays have picked it up and made it work. Since Sergio Romo made that fateful first start ( of two starts, back-to-back), the team's staff has logged nearly 1,000 innings and 4,000 batters faced, and team ERA of 3.32 is second in all of MLB, trailing only LA's 3.23. TAM is also second to LA in WHIP over the period, 1.16 to 1.11. Those numbers include regular starts, especially by Blake Snell, but even at that, some analysts have reported that the Rays' team ERA in just the games with "openers" is top-five—and let's not forget these are games where the alternative is to throw a pretty skeetchy fifth or sixth starter out there to get clobbered. I've talked about this with guests on the HQ Radio pod, and a common theme was that we need to wait until some other teams buy in. And they are. OAK (where the idea might have first been tried, way back in the early '90s) has started going with openers (Liam Hendriks the main guy opening games). The Rangers and Twins are using it, and MIN is also trying with its minor-league affiliates. It might become a thing, in which case we fantasy players will have to make some changes (subscribers only), or it'll die out. Either way, kudos to the Rays for shaking things up. Thanks... to Vladimir Guerrero Jr., for his miraculous season in the minors. Vladdy slashed .382/.438/.638 while shooting from High-A through Triple-A at age 18. Knock 25 points off his .256 ISO and you get Giancarlo Stanton. Knock 200 points off his 1.076 OPS and you’re in Khris Davis/Nelson Cruz territory. And no thanks... to the Player’s Union, who signed off on a set of rules that rewards teams for keeping young stars out of the game. Thanks... to the aforementioned Gene McCaffrey, who agreed to let me design the 2018 Wise Guy Baseball Annual. Gene was great fun to work with, and he was ever gracious even while his real life was getting very, very busy. The WGB came out really well and we got lots of compliments on it. 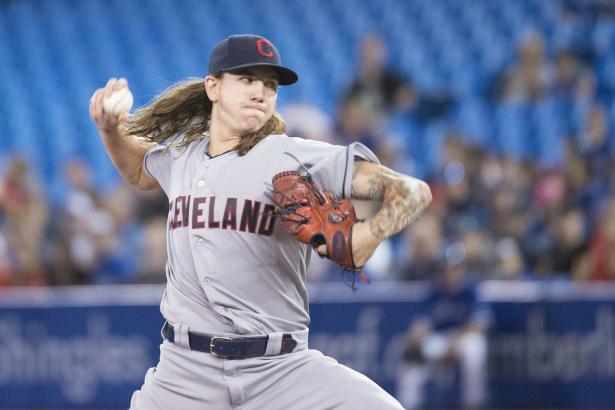 Thanks... to whoever in the CLE organization agreed to remove the Chief Wahoo caricature from the team’s uniforms on a road trip into Toronto. No need to get into the political correctness of these things, but up here in Canada, the aboriginal population is really (and rightly) sensitive about matters of appropriation and ridicule. The team is finally removing Chief Wahoo altogether after this season. Thanks... to trading partners in my league who saw the sense in speed-for-power deals that helped me climb out of the cellar in my league. Playing fantasy baseball is greatly enhanced when other owners look past “names” and auction salaries, and really consider an offer on its merits. Even in experts’ leagues, that ain’t always how it goes. And no thanks... to all the AL contenders who didn’t acquire any top players at the deadline. I carefully protected the FAAB hammer all season, and had to settle for spending $1,000 at the deadline on Jonathan Villar. His stolen bags helped, but I would way rather have had Jacob deGrom cross over. And finally, thanks... to all the readers of Master Notes and all the listeners to BaseballHQ Radio. We couldn’t do it without you!